Those of us with male dogs know how obsessive they can be about marking their territory, but did you ever think what this could be doing to your AC unit? Turns out that the acids in your dog’s urine are highly corrosive and can eat through your AC coil and aluminium fins. What does dog urine do to my air conditioner? 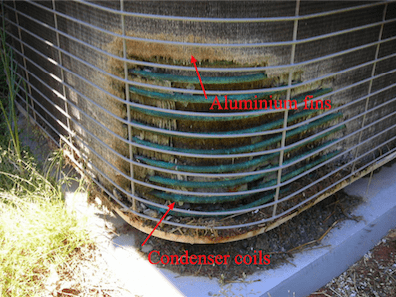 Dog urine quickly corrodes the aluminium fins and copper coil in your outdoor unit. If your dog’s urine hits the condenser coils, the corrosion will inevitably lead to a freon leak. If the leak is small and if you catch it early enough, you may get lucky and a professional may be able to find and repair the leak instead of replacing the coil. The bad news is that you will need to recharge your system with more refrigerant—and if your unit takes R-22 refrigerant (an old refrigerant that’s being phased out) this can end up costing you. If a small percentage of your fins are damaged, your AC will still function but will transfer heat at a slower pace. Basically, your AC has to work harder without as many fins. This results in higher energy bills and an inefficient air conditioner. But if a large portion of the fins are corroded you may want to look into…. Your condenser coil and fins are attached so if only one component is badly damaged, you’ll still pay to have both replaced. This replacement job requires a professional. In most cases, replacing the coils and fins is the best solution for dog urine corrosion. But if a replacement isn’t available or if your AC unit is older, you will probably be better off replacing the entire unit. Oftentimes, the cost to repair the fins and/or coils will be just as (if not more) expensive to replace the outdoor unit entirely. So, if your fins or coils are heavily damaged and your AC is over 10 years old, it’s usually more practical to replace the unit. Now that you know the kind of damage that dog urine causes, you’re probably looking for a way to keep your dog away from your air conditioner. Adding a fence around your AC usually does the trick and is relatively inexpensive. If you are interested in building a fence around your AC unit, it is important to build it AT LEAST 3 feet away from the unit. You’ll also want to stay away from solid coverings that block airflow and completely encasing the unit. Your outdoor unit needs room to release the heat from inside your house, so be sure that you aren’t accidentally suffocating it. In addition, if you ever need repairs done to the unit in the future, your AC technician will need to be able to fit in between the unit and the fence, or the fence should be removable if it is tightly enclosing on the unit.